There are times when writing is a breeze. You sit at the desk and ideas come every second, or so it seems, and other times when new concepts flow like mud. Generally I think the muddiest times are the beginning and end of a novel, while the buzzing period is invariably the mid-point. That’s the time when the book is full of potential. You have all the characters fleshed out, their motives, their points of reference and interest, and they start to take over with a lot of extra action and developments I would never have thought of at the outset. It’s fun in the middle. But the beginning and end . . . Hmm. At the beginning it’s less problematic, of course. Any issues can be sorted later – at the end. That’s where I am now. Editing and checking all the links, all the red herrings, all the tweaks I added on a rainy Sunday afternoon – they’ve all come back to bite me in the arse. That’s how it feels usually, anyway. The last few pages are hardest of all, to be fair. Because you want the book to work to a logical, consistent ending that doesn’t jar the reader. I always think of it like a dagger-point, with all the strands coming together at the tip. This one, thank goodness, is working well to that end. so far. There’s still time for it to go way off course! But it’s so slow, because it feels always that almost every sentence has to be validated with an earlier statement or scene, making sure who said what and when and to whom. It’s the part I find most difficult. Luckily it’s also enormously rewarding. And rather good fun on this book. I think I’m going to end up feeling very smug about book 31! More smug than earlier this morning, no doubt. I had a great feeling of happiness having decided which new mobile phone I should go to, after a lengthy conversation with a helpful Orange operator, who persuaded me away from my first choice after looking at my actual usage, and saved me a lot of money. 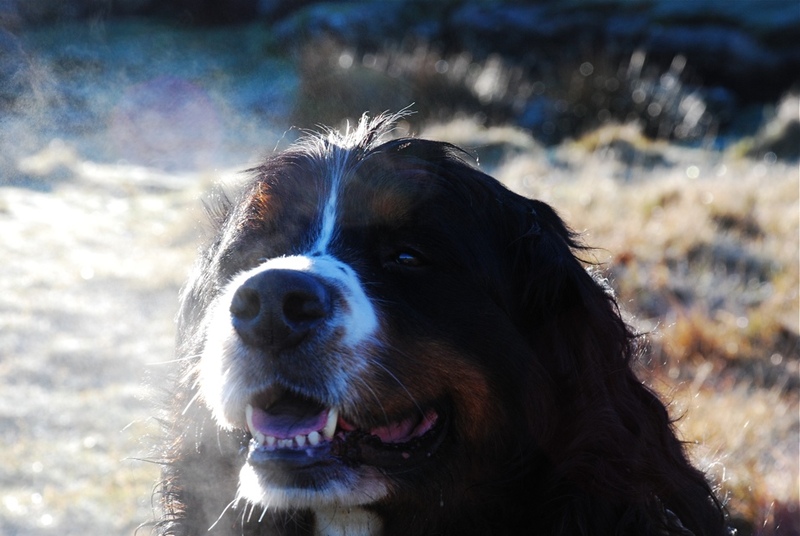 That was great, but my initial joy was offset by the sight of my Bernese Mountain Dog. She had taken advantage of my chat to go and find something particularly revolting and roll in it. Back home to a cold shower for her. But all in all a good enough morning. Tonight I should finish the main work on the book, and then it’s down to final tidying. A happy time. If the dog doesn’t roll again tomorrow! This entry was posted on Tuesday, April 5th, 2011 at 3:15 pm	and is filed under Blogroll. You can follow any responses to this entry through the RSS 2.0 feed. Both comments and pings are currently closed.